Can Toys R Us Survive by Learning Lessons from The Entertainer Toy Shop's Relative Success? In December the British arm of Toys R Us came to within hours of going bust the followed it's american parent company's filing for bankruptcy protection in September 2017 which that triggered a downsizing programme through rapid store closures that are likely to see at least 200 of it's 866 US stores close in an attempt at reducing its $5 billion debt mountain which dates back to its leveraged buy out of 2005 that costs Toys R Us $400 billion a year in interest payments. 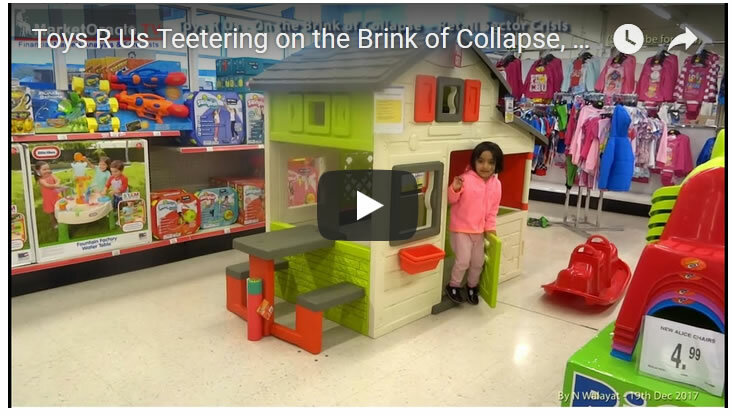 However, whilst Toys R US managed too get through December's crisis but still remains in deep distress, whilst The Entertainer Toy Shop chain is thriving with its much smaller stores more convientely located within popular shopping malls, rather than ToysRUs's huge stores in distant retail parks as the following video illustrates of one little girls birthday shopping trip to The Entertainer Toy Shop. So if ToysRUs wants to survive then they clearly need to downsize and relocate to where the footfall is i.e. large shopping centres. Of course this would mean they would be competing against the likes of The Entertainer, and so given ToysRUs's huge debt mountain the retailer may not be in financial fit shape to perform such a costly transition from unprofitable mega-stores to smaller more convenient stores whilst at the same time having to service a huge debt mountain. But the bigger problem is the INTERNET, which is slowly KILLING ALL RETAILER. So ultimately the same fate as Toys R Us awaits The Entertainer and the rest because bricks and mortar retailers just cannot complete against the online retail giants such as amazon with their far lower overheads. So ultimately Toys R Us trying to follow The Entertainer's lead would be just buying some time. Meanwhile The Entertainer continues to open new stores whilst Toys R Us closes theirs.